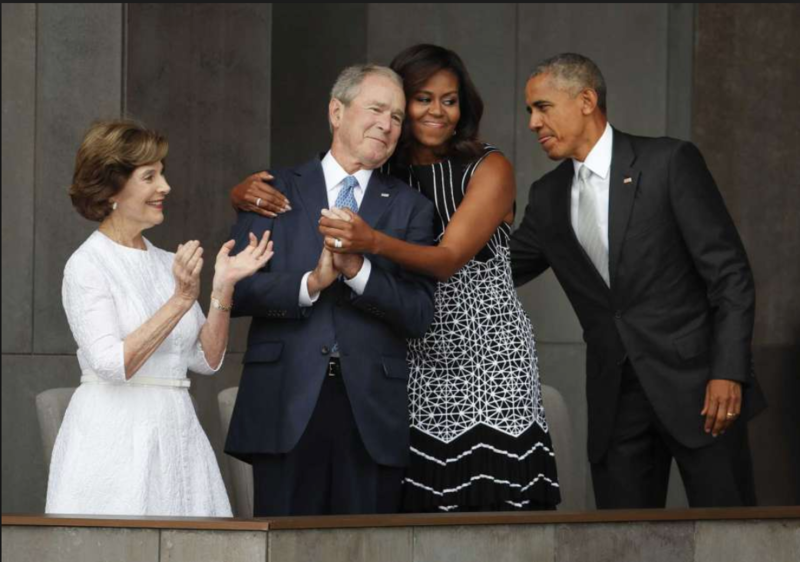 You may have noticed that former First Lady Michelle Obama has a very friendly relationship with former President George W. Bush. Like the time, he slipped her a piece of candy slyly at his father's funeral -- or when she called him "my partner in crime." "My relationship to George Bush...resonates with so many people. I think Americans want us to look past Party and race and understand that there's so much more that brings us together." Obama's words are meaningful, though she should remember that sentiment when dealing with other figures she has political disagreements with. Recently, she mocked the gift given to her by First Lady Melania Trump at last year's inauguration -- and has said she stopped trying to smile that day. The whole exchange sounded like "Mean Girls" revisited. It's great that Obama has a good relationship with President Bush. It would be terrific if she could extend the same kindness to her successor.